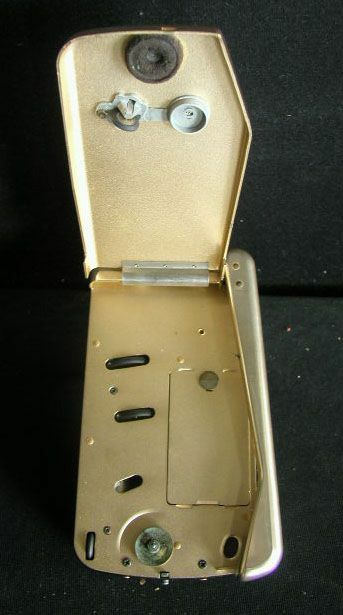 First produced in London by Baird in 1960, this is probably the first portable record player to have a similar form factor to the PS-F5. Definitely a direct ancestor. Lots of photos and info on Electric Gramophone, including a complete strip-down. Image courtesy of Rick via Flickr. Thanks. Read more at Retro Thing. 70s greatness from the U.S.A.
Looks in reasonable condition. Strange to see one without the “It’s a Sony” sticker on the front. No matter how many times people have predicted the death of vinyl over the years, it refuses to go away. Many releases by bands old and new, on small and large labels, are still pressed up as records. It’s not just the older generation that are continuing the tradition, but younger generations are discovering the joys of vinyl’s great look and feel. In a world of the virtual, it’s a reassuringly real medium. “Analog (or analogue) recording (Greek, ana is “according to” and logos “relationship”) is a technique used to store signals of audio or video information for later playback. Fed up with the music industry’s rip-off tactics: buy it on vinyl, throw away your vinyl & rebuy it on CD, throw away your CDs & rebuy it on MiniDisc, throw away your MiniDiscs & rebuy it on Audio DVD, throw away your ADVDs & rebuy it as a digital download… People are now realising that the whole cycle is an unnecessary waste of money where the main beneficiary is the music business (rarely the musicians). Many who dumped their old LPs wish that they hadn’t. With companies like The Vinyl Factory keeping the production going, it looks like there’ll be no shortage of great records to play on our trusty turntables. “Best Buy is giving vinyl a spin. The consumer-electronics giant, which happens also to be the third-largest music seller behind Apple’s iTunes and Wal-Mart, is considering devoting eight square feet of merchandising space in all of its 1,020 stores solely to vinyl, which would equate to just under 200 albums, after a test in 100 of its stores around the country proved successful. A Canadian scientist recently discovered that teens prefer vinyl to CDs. Rock dinosaurs keep plodding along. The Guardian (UK) about the increase in UK vinyl sales in 2007. BBC: Oxfam cashing in on record collectors. BBC: Vinyl production back in fashion. CNET’s The Audiophiliac Vinyl: Not just for audiophiles? The Vinyl Factory Manufacture from thevinylfactory on Vimeo. Vinyl manufacturing in the UK. Want To Buy a New, NOS PS-F5? Feeling Flush? 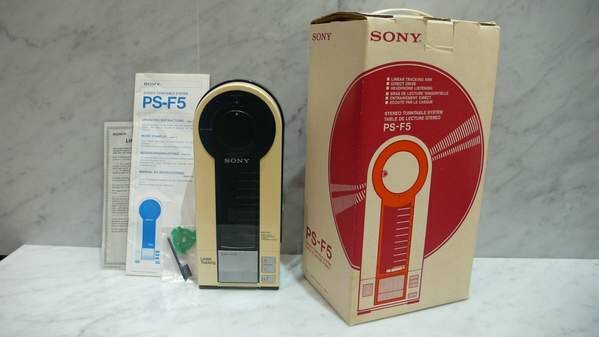 Ruten, eBay’s Taiwanese branch, currently has a barely used PS-F5 up for auction here. $30,000 in Taiwanese money today is over Â£560 (US$900)! As I type there’s just over 2 days left to run and perhaps unsurprisingly, there are no bids. Update 11/7/09: It didn’t sell and has been relisted at the same price. There have been times when I’ve bought records which could do with a really good clean. In future I might use this approach: to spread a thin layer of PVA wood glue over the record with a credit card, let it dry and peel it off. More information at Audio Karma. Via HiFi Tubes. 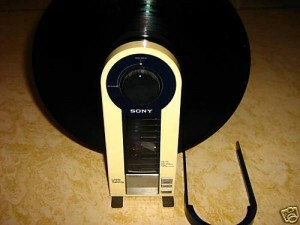 You are currently browsing the Sony PS-F5, PS-F9 & Flamingo Portable Linear Tracking Turntables blog archives for July, 2009.